Let Vision X light the way with the Vision X LED replacement fog light kits! These proudly made in the USA lighting kits are a great way to add extra visibility to your vehicle without having to drill any holes. Manufactured to be vehicle specific, you can have one of these on your truck in no time flat. 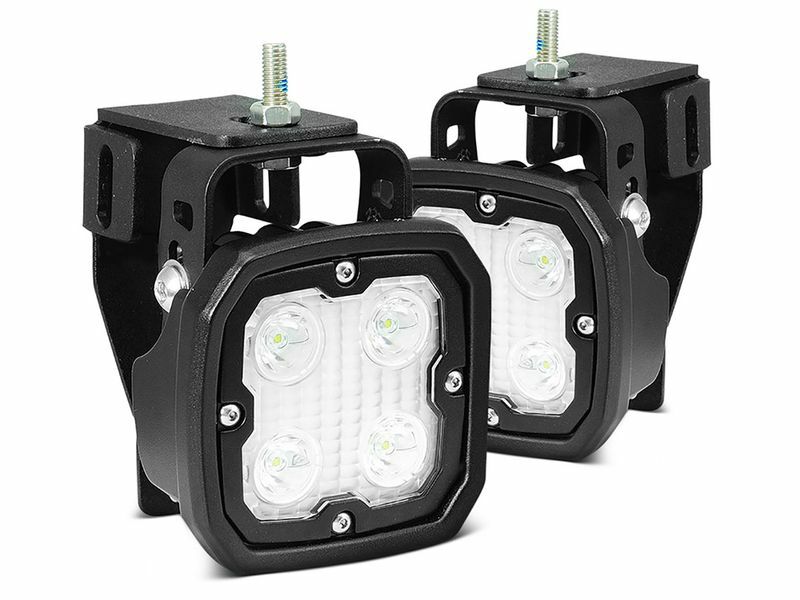 Constructed into a resilient, black aluminum housing these light kits are made to last. That means, once you get these on your ride you won't have to worry about them falling apart. With a durable polycarbonate lens on the front, you get optimal lighting while protecting the bulbs. Install them directly into the factory mounting system on your truck. Comes complete with all install hardware and weatherproof Duetsch connector. This connector protects all electrical parts from water, dirt, and debris. Sometimes you may wonder, "What more can I do with my vehicle?" well we have a simple solution for you! Get the Vision X LED replacement fog light kits and let your ride light the way! Investing in high quality lighting may seem scary, but you won't be disappointed. Warranted items will be repaired to working condition and returned without cosmetic alterations. Proof of Purchase is required to validate warranty and is valid from the original date of purchase. All units must be bought through a local authorized Vision X. Improper installation, accident, abuse, neglect and normal wear are not covered under warranty. Off-road light warranty does not include consumables, such as bulbs or broken glass. Halogen bulb warranty does not cover broken glass due to improper installation or abuse. Lights are operated in environments under 150° Fahrenheit. The customer is responsible for all shipping charges to Seattle for warranty. Non-warranted items can be repaired at the customer’s expense of parts and labor at the discretion of Vision Motor Sports, who will provide an estimated repair cost before proceeding with the repair. The information on this page is subject to change without notice. Full warranty information can be obtained by contacting Vision X at 1-888-489-9820. To receive a return authorization, contact the dealer that you purchased your product from, or call 1-888-489-9820. Once a return authorization number has been issued make sure to display the number on the outside of the package for identification. Providing proper procedures have been followed, general turnaround time is 72 hours for refurbished products. defects and does not cover consumables. Install the vehicle specific Vision X LED Replacement Fog Light Kits on your vehicle in no time! With a quick and easy installation process, you don't have to worry about getting these on your ride. Give us a call at 877-216-5446 if you have any additional questions!